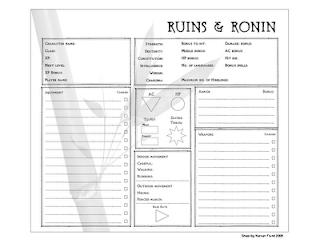 I whipped up a multi-page character for Mike D's Ruins & Ronin. 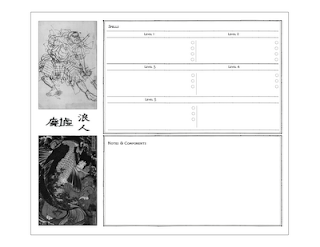 The images link to the PDF download. Once at the table the decision was made to hew toward the slightly crunchier side of things. We could have made Veritech a keyword and been done but we wanted to bring the mecha a bit more to the forefront. 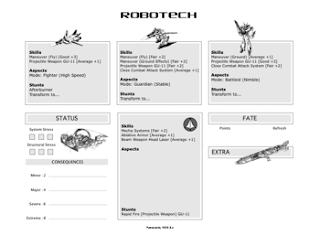 Using the Mecha Game Requirements Doc and the resulting PDQ Robotech Character Sheet as a guide we were able to quickly put together a multi-mode Veritech in HQ 2.0 terms. The sole player character is in a VT on a routine patrol when a call comes in that a group of Zentraedi in battle pods are battling it out with overmatched local security over a protoculture chamber. It is imperative that the Zentraedi marauders be stopped. The VT pilot strafes the zentraedi position (minor victory) with the GU-11 blowing a leg off an unaware battle pod and announces that they are to lay down their weapons. The marauders will have none of it. As the veritech changes modes to evade enemy fire a Nousjadeul-Ger male power armor grabs the protoculture chamber and begins heading toward the nearest tree line. Deciding to ignore the battle pods the intrepid RDF pilot transforms to Guardian mode and skates his way toward the fleeing protoculture chamber thief. The thought that there's an escape ship hidden in the trees zips through the VT pilot's mind. The battle pods rally on their leader and pursue the enemy while raining down withering cannon fire. For the most part the VT pilot evades but a few blasts strike home. He's starting to feel outmatched and is thinking that it was a tactical error pursuing the power armor without first dealing with the battle pods. On top of all that it turns out that it's too dangerous to take a shot against the power armor because he might hit the chamber. He can't get an angle. Particle cannon blasts shake the veritech causing its systems to flicker. 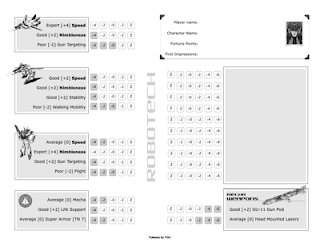 The Zentraedi have scored 5 resolution points versus the VT pilot and are ready to strike a parting blow. The VT pilot keys his radio ready to call in a SITREP and to request backup while disengaging the enemy. The zentraedi fumble their parting shot while the VT pilot rolls a critical success which gets him back into the game. The battle pods became too eager in their pursuit and strung themselves out causing problems of position and diminished concentration of fire. Their error presents the VT pilot a small window of opportunity that must be taken in the next moment or it will vanish. In jet mode the veritech is wheeled around with afterburners lit. Skimming the deck with a wash of dust trailing behind, the VT pilot bears down on the male power armor that has just made its way to the trees. In a split second the veritech transforms into battloid mode. Still hurtling toward the tree line a short burst from the GU-11 cripples the power armored thief taking his exposed leg out from under him. Now from the concealment of the forest the VT pilot rocks the GU-11 with deadly accuracy wreaking havoc on those that were once his pursuers. Those that are able to flee do so. Those that cannot are either dead or are in the process of giving up. The VT pilot has taken the zentraedi to 5 resolution points and succeeds in his parting shot easily kicking the enemy while they're down. Finally able to take a break a call back to RDF base is made and it is declared that the protoculture chamber has been secured. The enemy is fleeing and support is necessary for pursuit. From behind the VT pilot's position an obviously salvaged zentraedi troop transport ship bursts from the forest and heads for destination unknown. The VT pilot won't be pursuing today. His orders are to stay put till reinforcements arrive and to return to base for repairs. For the last 9 months we've been hard at work developing 'Solus' a post apocalyptic setting for our live-action airsoft game Firefight! After setting the premise and constraints of the game world much of the process has consisted of creating individual gaming events that fit our vision. Brainstorming and LEGO-style snapping of ideas together takes the concept of developing "adventures" in a game world only so far. Typically what looks like a complete event outline has holes and leaps of logic that are not only inelegant but also difficult to bridge once the game starts moving. The gaps can be closed on the fly but this isn't an optimal approach because in live action hand-waving an NPC as an agent of change into or out of existence is quite difficult. 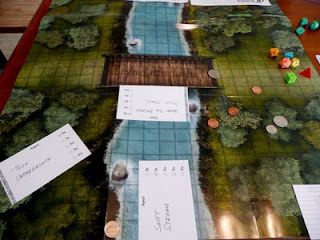 In attempt to close holes ahead of time we've been using tabletop gaming to jump into the setting to test our outlines. As we have increased utilization of this technique the positive feedback given after game events has gone up. We started with The Shadow of Yesterday to test the concept and it worked out very well. The system felt neutral enough to allow us to really play in the Solus setting. Next we tried PDQ and it worked great. Both systems are very good games and are flexible enough to accommodate virtually any setting. I picked up Heroquest 2.0 because I had heard so many good things about it over the years but had never seen it. I had no idea that in time it would become the system that really kicked the setting dev process into high gear. Heroquest has the qualities of fast and flexible but it also has something else. Keywords. A Keyword is a sort of macro that encompass a broad set of character abilities wrapped up into a single word or phrase. 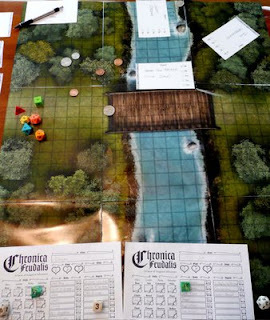 This feature allowed us to not only flex the system for our setting but it also helped us reinforce the setting with the Firefight! system even though they are two different rule sets. In Firefight! there are 3 main character types; Brains, Jack of all trades, and Action. 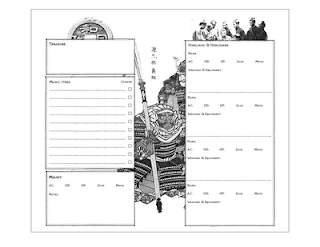 Each character type has exclusive access to system bits that provides unique abilities in the game space. The beautiful part is that these character types became Keywords. The benefits were myriad. Character creation time was dramatically reduced which allowed us to jump straight to the point of the endeavor - setting development. The amount of material covered in a very short of amount of time went way up. Concentrating on the setting took far less effort. Upon reflection I think the productivity gain is the result of reduced "context switching" between the setting in play on the tabletop and the live action system that will be used out in the field. The scope of Solus scales up from the struggles of the individual through that of their comrades in arms to the actions of larger entities maneuvering to make life better and/or to snuff out those who get in their way. This too was pleasantly easy to handle. Don't think that I look at Heroquest 2.0 as just a tool. It's a lot of fun and hope to get a proper campaign off the ground soon. Who know. Maybe it'll be Solus. The blood-dimmed tide is loosed,..."
It's obvious that I haven't been posting much recently. It's certainly not because I don't have much to say. We're full bore into prime airsoft season and it has taken most of my attention for game development. At the moment we're running our Firefight! Solus campaign and I'm developing software to manage MILSIM games. In parallel I'm reading Heroquest 2.0 and am loving it. I could have skimmed the book and started running but I'm taking it slow so that I can absorb the HQ lessons of approach and style. I'm glad for doing so. Much of what I've read reinforces my notions about story telling through gaming. Some of it doesn't but that's okay because everything makes sense. It feels good to be learning something. 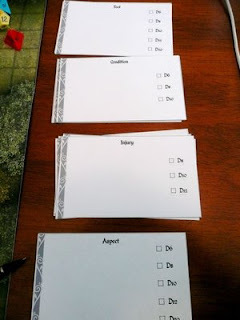 In the past I've used index cards for FATE 3.x based games to help everyone keep known aspects straight. Write the aspect on a card and put it out onto the table. Anything that keeps the GM and players from repeating themselves is a good thing. 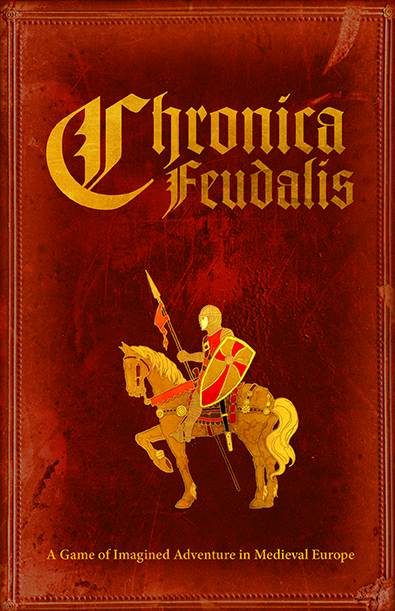 With Chronica Feudalis the blanket term Aspect is not precise enough so I made cards for Aspects, Injuries, Conditions, and Tools. Each card has a number of ranked checkboxes for indicating rank/severity. The photos are from our first game using the cards. Last night I ran a mini test session where Jip the gnome goblin slayer and his human friend Siggurd are tracked down a party of goblins that were led by a goblin shaman. We approached magic the way we did when playing Middle Earth with Spirit of the Century but with some CF specific tweaking. Casting a spell costs a point of Ardor and includes invoking the Aspect: Dark Arts D8. Casting was handled much like maneuvers and inflicting conditions. Spells are also able to create tools on the fly. A single success creates a D6 tool, double D8 tool, triple D10 pool just like conditions. As Siggurd's arrows were killing goblins, on the fly the shaman created a magical camouflage cloak D6 that would be crucial for his eventual escape. All the while Jip was sneaking on a flanking maneuver hoping to get close enough to launch an attack on the goblin magic user. The shaman caught Jip's movement out of the corner of his eye and subsequently won initiative for the round. He cast a Disorientation (D8) spell on the gnome that as it turns out would be endured for the entire scene. As Jip swayed and while Siggurd became bogged down in melee the shaman shot a blast of eldritch energy at Siggurd causing a point of Vigor loss. Now the shaman is out of Ardor so he turns to run. Jip manages to make chase while Siggurd mops up. During the chase Jip endures the Disorientation (D8) and the shaman endures his aspect Decrepit D8. Little by little the shaman puts more ground between him and his pursuer. Eventually Jip runs out of Vigor and the old goblin slips behind a massive tree, casts a small spell and flies up out of the forest on a gust of wind. Magic was resisted by Will or Reflex depending if the magic condition attacked the mind or the body. We have a conversation going on over at RPG.net on the subject where the CF author mentions the concept of Dark Ardor that can be used to invoke the Dark Arts aspect at its heightened rank. As of now my intention is to keep the concept of magic as freeform as possible with the guideline of the effect being ranked. This way magic is powerful but not earth shatteringly so. But it would be cool to get a small spell list put together for inspiration. I ran a short session of White Box Swords & Wizardry the other night and was caught by surprise. The oldest and best serving hireling, the map maker was killed during an attack that seemed to be out of the blue. Now the party is wondering how to approach his family about it because they feel terrible. Three or four sessions ago after a bad wilderness encounter the party made their way back to the map maker's house to recover. 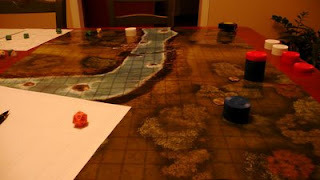 Once there, while the PCs were strategizing a new approach to the ruins on the hill the map maker himself was out working his connections to plug the gaps in the party's skill set. Now he's gone. I'm caught by surprise because "the game" is even better than I had remembered it.